If you know how to weave and would love to create original patterns and then weave them into a variety of designs, then this workshop is for you! 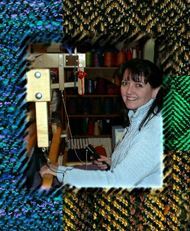 Join nationally known fiber artist Robyn Spady as she gives us an in-depth look at the amazing versatility of the twill weaving structure. This class is for weavers looking to further their knowledge about twills with an emphasis on advancing and networked twills, but will also cover corkscrew twills and echo weaves. weave a sampler with a variety of patterns and designs. Please Note: The BARN Fiber Arts Studio has 8 floor looms available for use in this workshop. To reserve one of our looms for this workshop, please click on the appropriate "Member Discount Price - Need to use studio loom" or "Guest Price - Need to use studio loom". OR click on Guest/member "using table loom". Students are required to warp their looms prior to the beginning of the workshop. An instruction sheet and pattern will be supplied to you in your confirmation email sent to you after you register. Please look for that confirmation email in your "spam" folder if you have never received emails from BARN before. Information on times when students will be able to warp studio looms will be sent before the workshop. If you plan to bring your own loom you must use a 4 shaft loom or higher. Table looms will work for this class. Materials: $15. The materials fee is for a notebook Robyn provides with detailed information about the content of the workshop. The material fees cost will be added to the workshop fee when you register for the workshop. Skill Levels: This workshop is appropriate for a wide range of weavers including those who have only taken a beginning weaving class to those who are advanced weavers. Please bring a bag lunch. BARN has a refrigerator to store your lunch. Fiber Arts Studio Artist-in-Residence: Robyn Spady. Robyn Spady is a national treasure in the arts and crafts field, and we are are delighted that she is our inaugural BARN Fiber Arts Studio Artist-in-Residence. Robyn is often the keynote speaker at conferences and meetings across the country, and she also does hands-on teaching. She is the author of numerous books and writes regularly for various fiber publications, including Handwoven.